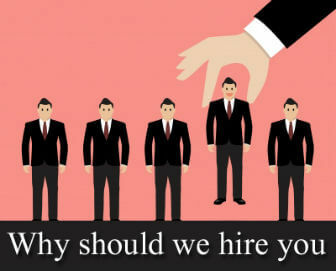 In this section, we are going to discuss about how to answer the tricky HR questions, "Why should I hire you" with best examples and answers for freshers and experienced programmers, engineers, bankers, testers etc. Required skills: Outstanding knowledge of different layers of protocols, networking, C, C++, Java and C#. Good understanding of computer basics, Operating Systems (OS), and MS-Office. Good logical and problem resolving skills. Answer: As, I have just started my career, I don’t have practical achievements, but I really want to practically explore and experience my potential by delivering the best services to the company. It will be my honor to work with you and this organization. The primary goal of any organization while hiring employees is their loyalty and hardworking nature. I am loyal and hardworking since my childhood – in my school and colleges, I was one among the dedicated set of students who had been completing the task or assignment on time. For these excellent qualities, I got appreciation many time during those periods. I am the best fit for this job profile, due to my outstanding programming (C, C++, C#, HTML, and .Net), networking, analytical and problem solving skills. Also, I have practical experience in many Operating Systems. Required skills: Candidate should be having excellent communication skills and he/she should be certified in “.Net framework”/ have done the .Net courses. Answer: Well, I don't have any professional work experience, but I have done the .Net framework training courses form NIIT Institute and also I have taken .Net framework certification from there it-self. During my training courses, I had successfully completed many .Net projects. Although, I am very flexible, I can mold my-self in any direction and situation to successfully complete the assigned work by giving 100% result. So, presence of mine in this organization will be surely beneficial for me and this organization. Required skills: Excellent interpersonal skill, analytical skill, and problem solving skill. Profitably, good in team work, sharing ideas, and interacting with customers and clients. Technically sound and should have excellent computer knowledge. Answer: As, I am a fresher, I don’t have any work experience, but I strongly believe that I am much more capable in giving significant contribution that will be surely beneficial for the company’s growth point of view. My contribution will surely place company at top five in the market. For a long time, I was trying to get into this company, but just now I got a chance. I can ensure you that I will always try to focus on company's vision, goal, and things that can become a reason of company success. If, I get this employment - I would surely apply newly obtained skills & thoughts for company benefits. I would shortly become a superb team player. Quickly, I will try to understand the work culture. I will never cross the dead line of the assigned work. And, I will stick to company's rules, guidelines and policies on the work ethics. Required skills: Candidate should be hardworking, analytically sound, and a good team player. Also, he/she should be having good understanding of Java, J2EE, C++, Android, iOS, blackberry, and mobile technology. Answer: As, I have just started my career; I can’t give you any probe/explanation that strongly encourage you to hire me, but I can promise you that if I get into this job; I will be very loyal and dedicated for my work. I will always try to make good relationship with customers and clients. I will always take care of my team needs and will never cross the company limit. As, I am reliable, extremely hardworking, and strongly capable in understanding any process & making decisions with minimum supervisions, I can ensure you that I will always give the first priority to my responsibilities.